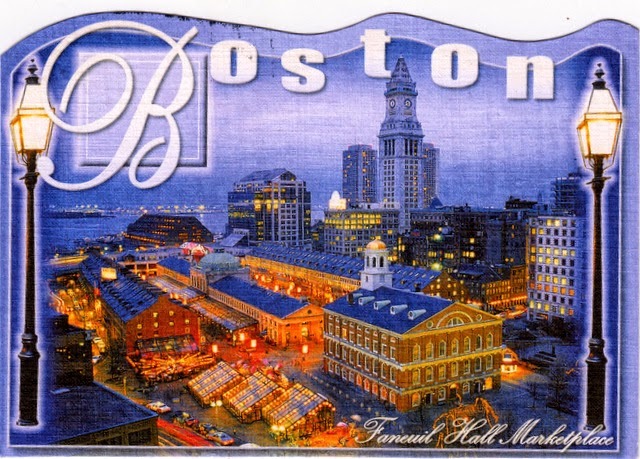 Postcard US-3230012 from Boston was a shaped card showing Faneuil Hall Marketplace near the waterfront and today's Government Center in Boston, Massachusetts. Built in 1743, it has been served as a marketplace and a meeting hall since. Because its significance in history as the site of several speeches by Samuel Adams, James Otis, and others encouraging independence from Great Britain, it is known as "the Cradle of Liberty." Faneuil Hall was designated as a National Historic Landmark in 1960. One of those famous stops on the Freedom Trail, Faneuil Hall Marketplace is part of Boston National Historical Park that was added to National Register of Historic Places in 1966. Boston’s St. Patrick’s Day parade made history today as two LGBT groups marched for the first time after decades of opposition. In 1995, the parade organizers took its battle to exclude LGBT groups to the U.S. Supreme Court and won on First Amendment grounds. Boston’s mayors had boycotted the event since. With an inclusive parade this year, Boston Mayor Marty Walsh, Massachusetts Governor Charlie Baker and other political leaders such as first-term U.S. Representative Seth Moulton took part. Boston broken another record today after receiving 2.9-inch snow by Sunday evening. A seasonal total of 108.6 inches so far, it has broken Boston’s old record of 107.6 inches since the winter of 1995-96. The buildup of previous snow on side streets even caused the organizers of the St. Patrick's Day Parade, billed as the second largest in the U.S. in terms of spectators, to shorten the route.